I thought that we would sugar and spice things up this morning, so grab a warm latte and join me for the fun! This week, we're going to get cooking on Mingle Monday! Last week's "What's your favorite holiday treat?" question got me thinking that we need to share our fave treats! Also, check out the bottom of this post for an adorable holiday apron giveaway!! Will you pretty please with sugar and sprinkles on top do me a favor? Please add this cute little Mingle Monday button to the bottom of your post today and mention you are a mingler! We've got to add as many people to our holiday festivities as possible! 3) Leave a comment with a link to your favorite holiday cookie/treat recipe to share with everyone! 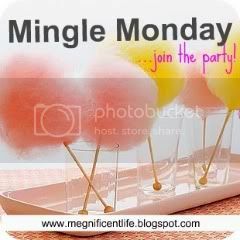 4) Go visit 2 other blogs saying hello from Mingle Monday! 5) Come back to [Life of Meg] and leave an encouraging review of the blogs you visited!! I thought this would be a fun way for all of us to swap our holiday recipes and spread some Christmas cheer! See below for details on how you can win the Retro Holiday Apron giveaway! CHECK OUT THE LATEST GIVEAWAY! One of my favorite holiday cookies to make! SO YUMMY! I'm not much of a baker... but my roommates are which means I get to taste many of the things they bake! My roommate made this hot chocolate a little while ago and it is so delish! I dont like coffee, so it's nice to have a warm drink this time of year that is so yummy! I made these super cute "cupcake in a jar" treats for my girlfriends over the weekend. They are easy and fun to make! I'll visit later as I must make Hubby some tea now. *Jessica Hester Photography: cute blog with fabulous photos...especially her new snow ones! 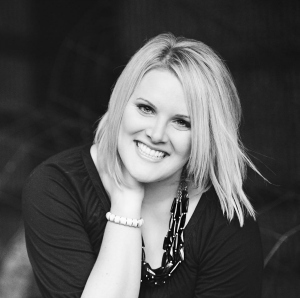 *Her Own Eden: great blog...and her most recent post has a fantastic wine/proposal idea. Love it! **Both blogs deserve a visit! Food Floozie: Umm... can I just say that her chocolate almond bread looks absolutely DELISH? Great blog and I am now following! Northwest Betty: Loved her Christmas tree photos and am envious that she has a real tree. Following her as well! Here's to a fabulous Monday! Today I visited I Dream Loudly. I love her simple layout and the style in which she writes. It's engaging and fun to read. Her latest post talks about how much she loved the latest Narnia movie. Definitely influenced me to finally go watch it! I also went by Her Own Eden, which is an amazing blog. Also very engaging writing. I loved her post about wine because I've recently started drinking it. First I went to Her Own Eden, and I spent a lot of time reading through all her wonderful posts! I loved her bottle of wine post-it really melted my heart! Then I hopped over to Northwest Betty, and she had some really fun posts- I especially LOVED the little drawer with love notes and stories that she and her husband found at one of their favorite bars! My favorite holiday treats are pizelles- an Italian cookie. It requires a special cooking iron, but a lot of places sell them now! Went to visit our lovely teenage blogger and feel in love with her clean, lovely blog. It has a nice feel and an openness that I adore. The I went to Chasing the Extraordinary and fell head over heels in love with her nook collection. Perfect! I adore mulled wine during the holidays. Today I stopped by Create Meaning and Northwest Betty! Create Meaning is really cute and girlie fun! Her post about playing video games with her boyfriend is making me re-think my stance on anti-video games! Northwest Betty had a post about her Christmas tree that really makes me want to go cut my own down! Her husband and her are so cute! Hi! Happy Holiday-ish Monday Meg! 1. Food Floozie - Love, love the recipes. I plan to try several of them! 2. Chasing the Extraordinary - from what I've read, Michaela seems like a list-making kindred spirit, super blog! My favorite holiday cookies ever are Chocolate Crinkles! I went to Desperately Seeking Starbucks and she's very witty - go check her out! I also went to AOG Daily and she has such a pretty Christmas tree! The second I went to was The Apple Doesn't Fall Far... she had a very busy and holiday-themed weekend. Looks like a great time and she has an entertaining blog! I don't think I could think of a favorite, but I just baked some homemade chocolate chip cookies (ala Joy of Cooking cookbook) and they were amazing. I think I have a new favorite holiday treat! I made this cake at Thanksgiving, and I think it will appear again at Christmas. So yummy! I also really like homemade Chex mix with Christmas peanut M&M's. I am followers of Food Floozie and VA Beach House wife. LOVE them both! I checked out Northwest Betty and Chasing the Extraordinary. Betty posted a fabulous looking pumpkin ginger loaf which I can't wait to try. Michaela at Chasing posted recently about her affinity for lists, which I totally get! I also feel lost without a plan or direction.